How exciting! 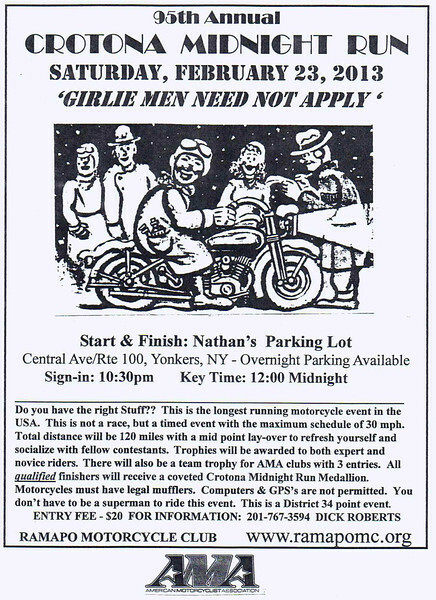 The date for the 95th Crotona Midnight Run was announced early this year by the Ramapo Motorcycle Club. The Crotona is a timed road ride in which participants must sustain moving at 30mph over a course of 120 miles, without the aid of GPS. Sounds easy enough, right? But the cold of February and the dark of the middle of the night keeps things interesting. 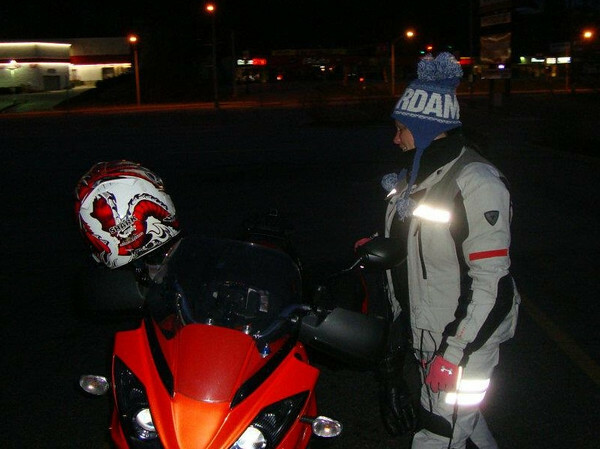 I completely nicked this picture of me at the 2012 Crotona from the Ramapo MC Facebook page. I really like how it highlights how dorky I am. I realized later on that the writing on the front of my hat, which says “AMSTERDAM” proudly displayed “TERD” across my forehead. You might want to “like” the gang at Ramapo on the ole Facebook. They have some pretty nice events throughout the year. Will I see you at the start this year? Cool, I had no idea they have already released the day. Yet again you rate off the cool charts! I’ve never even taken my motorcycle out at night. W00T! Are you gonna take the Husky or the Monster? my dad and mom used to do this run back in the late 40’s. they were members of the crotona mc.